Photo: Erica Urech Among other farmers’-market-driven options, Bossie’s Kitchen serves an epic Korean fried chicken sandwich. When Lauren Herman and Christina Olufson came to Santa Barbara to open Somerset Restaurant in 2016, they were two of the most important chefs in Los Angeles — even though you’d never seen them on television cooking battles or splashed on the front pages of magazines. The SoCal natives spent most of the previous decade building a restaurant empire for Suzanne Goin, becoming humble yet integral forces behind now iconic Southland restaurants such as Lucques and AOC. Photo: Erica UrechAfter years of running iconic Los Angeles kitchens, Christina Olufson (left) and Lauren Herman are overjoyed to own their own place. They quickly embraced Old Bossy, the cow that’s stood above the corner of Milpas and Canon Perdido streets for nearly 80 years. “This” is Bossie’s Kitchen, a fast-casual, organic-leaning, farmers’-market-powered bistro-meets-deli-meets-neighborhood hangout at the corner of Milpas and East Canon Perdido streets. The restaurant sits in the original home of the Live Oak Dairy, whose Streamline Moderne structure was built in 1939 and is still topped by the busy corner’s famous cow sculpture, known by generations as Old Bossy. Even more promising are the crowds that have steadily amassed since the January 29 opening, including many regular visitors who live nearby, like the mother-daughter duo who pop in multiple times per week, or the Santa Barbara High students hungry for the $9 half-sandwich/cookie/drink combo. “We just wanted to do something for the neighborhood that wasn’t fussy,” said Olufson. The stark-white, light-green, and sandy-wood decor is bright even on rainy days but is also soft and welcoming, and the food is fresh, flavorful, and comforting by design. “It’s everything we like to eat and cook,” said Olufson, who’s brought her renowned pastry skills to the cakes and other creations that lure from behind the counter glass, like the cardamom-glazed, pistachio- and candied-kumquat-topped donuts. Recent seasonal salad options included radicchio laced with citrus chunks, a Caesar with great crunch, and a kale and quinoa creation that was tied together with a zesty vinaigrette. These are definitely big-girl salads — never dumbed down, not afraid to play with bitter or sour, always textural, extra crunchy with just-picked freshness. 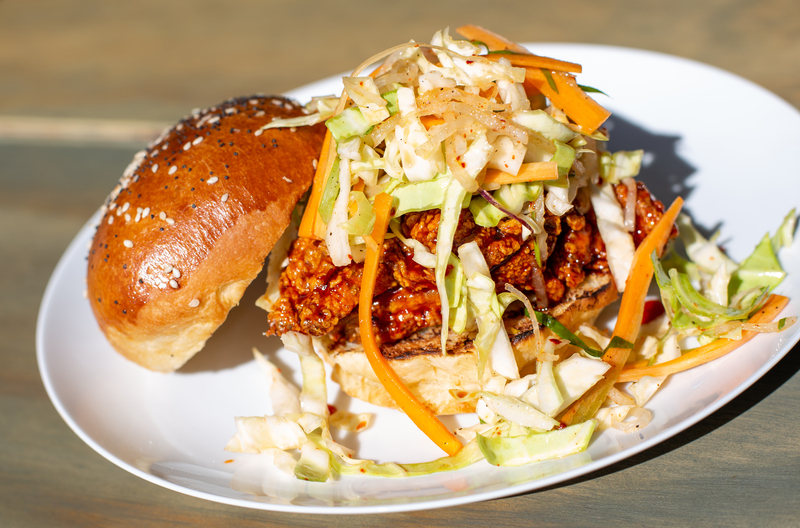 Another early hit is the Korean fried chicken sandwich — framed by Olufson’s just-baked brioche bun and cut by sesame-flecked slaw, the gochujang-spiced chicken patty is more conglomerate than whole slab of breast, making it hard to tell where one morsel finishes and another starts. The effect is addictive, making it the best fried chicken sandwich in town right now, amid fierce competition. Also popular are the weekend brunches and happy hours every Tuesday-Friday, 4:30-6 p.m., with $7 wine, $6 beers, and a menu that features two deviled eggs for $2, among other bites. “Lauren’s mom makes deviled eggs for every family gathering, and we liked them so much, we put them on the menu,” said Olufson. It may be the nightly specials that wind up stealing the Bossie’s show, particularly the $14 chicken pot pie on Wednesdays and $19.50 pot roast dinner on Sundays. Other nights explore more ethnic offerings, from Middle Eastern chicken tagine on Tuesdays to Italian meatballs on Thursdays to Korean-tinged salmon and Vietnamese-ish pork belly on Fridays and Saturdays respectively. Despite their illustrious résumés — they actually met while working in the kitchen of Lucques — this is the first restaurant that the couple owns themselves. “It makes the 18-hour days a little less painful,” said Olufson. They seem perfectly at home in Bossie’s, sporting wide smiles even as the lines pile up, and Santa Barbara suits them well. Their first date was actually up here, and they got married in Summerland, near where they live today.